The Leatherman Surge is one of our two largest multi-tools; a real powerhouse, built with our largest pliers, longest multi-tool blades and easy-to-use locks. A unique blade exchanger, replaceable 154CM wires cutters and four outside-opening blades give you quick access to the tools you use most. The Surge was built for tough jobs and the hands that do them. 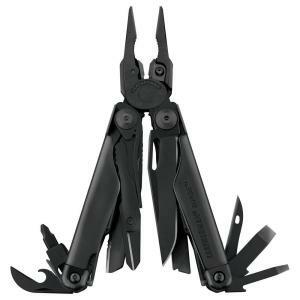 Tbook.com crawls the web to find the best prices and availability on Leatherman and related Tools and Hardware products like Leatherman Tool Group Black Surge 21-in-1 All Purpose Multi-Tool. For this page, related items include products we find that match the following keywords: "Leatherman" at our vendor partner Home Depot. Leatherman Tool Group Black Surge 21-in-1 All Purpose Multi-Tool is one of 14 Leatherman and related products listed in the Tools and Hardware section of Tbook.com If you have any questions on this product, please give us a call at 734-971-1210 during the hours of 9am - 5pm EST for assistance. Thank you for shopping at Tbook.com, the Internet Department Store!